You must make reservations at least 5 minutes in advance of the time at Qi Dumpling Lounge. We specialize in hand crafted Dumplings that have a light thin skin. 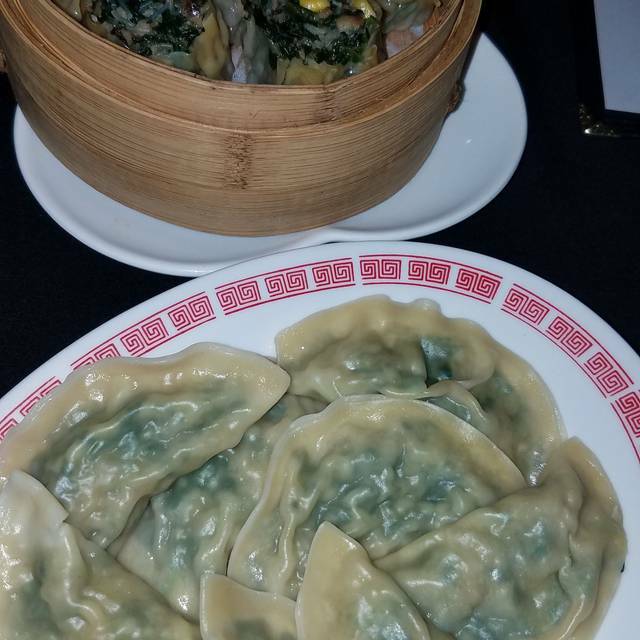 Our personal favorites are the Ying Yang Dumplings( pork, shrimp & chive dumplings) and Cilantro Chicken Sui Mai. We also have many Asian Tapas and wok tossed specialties such as Szechwan Pork Noodles ( minced pork noodles in a spicy garlic sesame paste), Soy glazed Pork Belly Sliders( lotus bun finger sandwiches) and Dry Braised Eggplant ( spicy eggplant dish wok tossed in a garlic bean paste). Also, we definitely recommend a hot bowl of Won Ton Soup in a home made gingery chicken broth! Please enjoy of menu of unique creations. We try to bring you eastern traditions with a modern twist. Enjoy! Celebrate your birthday with us and receive 10% Off! Valid ID required. Fast and easy ordering, dumplings were very good. Want to try more of the different noodles and other dishes, I wasn’t crazy about the spicey noodles but that could just be my taste. This is one of those restaurants you find very rarely, The food here is amazing its our new favorite! A very disappointing experience in all respects. Anyone writing reviews in recent months are doing Open Table users a disservice. When I complained that if the did intend to me open they should not take reservations at that time. Have been here twice with large family group of 10 and small friend group of 4. Food and service was delicious and great. The dumplings were very succulent and all dishes very flavorful. A favorite spot of ours. Really tasty food. We ordered way too much! The service was very sweet. It was Valentine's Day, and they brought little gifts (jade beads, etc) to all of the tables for the ladies (I know). But it was a very thoughtful touch, and we appreciated it. Had been craving dumplings and these were very good. Nice selection including vegetarian and seafood. Garlic noodles were also delicious as was spicy fish. Atmosphere was surprisingly pleasant and service was attentive and gracious. Nice gem on Grand Avenue. Would definitely return. Was looking for a tasty lunch while in Oakland for the day. Qi Dumpling was certainly yummy and very reasonable. Plenty of options for our vegetarian friends. Will definitely go back and recommend it to our friends. Very attractive. Good for a drink. Food needs improvement. On this occasion Qi Dumpling was not as inspiring as in our multiple past experiences. We had brought friends from China to experience the creative dumplings we had experienced in the past. All dumplings arrived just warm and lacked the flavors we had on previous visits. We will return and hope this was a one time experience. Disappointing. I don't know if we hit them on a bad night or what, but it sure wasn't what we were hoping for based on the reviews on OpenTable. The service was miserable and the food just passable. It took them 20 minutes to take our order. One of two dishes came out 20 minutes later. An hour into our visit, I stood up and they suddenly realized that we never got our second dish. Paid them what we owed and left. Service was efficient. Food was fresh, hot and tasty. We once again enjoyed the dumplings at Qi Dumpling Lounge. We enjoy the variety and mix of veggie-vegan along with chicken-shrimp dumplings. All were well prepared and presented. All were thoroughly enjoyed by all three of us. We will continue to return. Love Asian dumplings and noodles? This is a great place to have it all! In our ongoing search for great dumplings in the Oakland/Berkeley area, we tried Qi Dumpling Lounge given it’s high ratings. Unfortunately, the Ying Yang dumplings were average (skins were a bit thicker than thry should have been and the filling was under seasoned). We also tried the honey garlic spicy chicken wings - Korean Fried Chicken (KFC) wings at Bowl’d are much better. The star dish that night were the pork belly sliders - saved the meal from being two stars. I do want to mention that our 6:15 reservation had us sitting with blinding sunlight reflecting off the polished wood floors through the open front door. No shades to minimize the glare. We won’t be back unless we have a craving for their pork belly sliders. Otherwise there are many other great options in the area to try. The search for dumplings in the East Bay comparable to Dumpling Time in SF or to Din Tai Fung globally continues. This spot is a hidden gem...great food, solid service and the overall value of the place is great. Would highly recommend!!! Fantastic food at a great price. Fun for groups. Qi Dumpling continues to be consistent and have authentic dumplings that we crave. We enjoy the variety of well prepared dumplings and always look forward to being able to have veggie options too. The Mongolian Lamb was outstanding! Hot and spicy but just at the edge of my comfort level. My mother loved her much milder chicken and shrimp with snow peas and water chestnuts. $5 beers is a pretty good deal. Fresh dumplings are always a good thing. We tried two kinds, along with a sampling of the menu. We would go back. We had a wonderful valentines experience! They gave me some beautiful earrings as a “special gift” for the ladies on Valentine’s Day. It was lovely. They also served my prosecco in a chilled glass. And the green dumplings were super yummy! Pleasantly surprised. No bar, and only a pretty limited selection of beer and wine, but the food was good, and prompt, and the service friendly. The dishes aren't as exotic/street-foody as some of the ramen shops that've sprung up, but it's a big step up from the sort of find-it-everywhere Chinese food that seems designed not to scare away Americans. Not surprisingly, the dumplings and noodles are especially good. There's a small parking lot next door; you should at least try. Street-parking on Grand is wretched for blocks in either direction. Excellent service, very clean, attractive decor. Dumplings were good though not particularly special. This was our fourth visit to Qi Dumpling Lounge. We took a family member who enjoys a variety of dumplings and appetizers. All three of us were fully satisfied and very happy after our meal. Qi's take on traditional dumplings are always fresh, tasty and very satisfying. We can not wait to return for more of their wonderful dumplings. We suggest that the timing of dishes be more thoughtful. Everything doesn’t need to come out at once. The pork sliders were so delicious we ordered a second portion. We had a very good time trying different dishes and sharing. Great Asian fusion restaurant with good dumplings, soup, and noodle dishes, and good meat and vegetarian and vegan options. Everything was really flavorful and service was really nice. Would go again.